What can herbal medicine help you with? Are you thinking of trying out herbal medicine for minor ailments but don't want to commit to an appointment right now? Why not try herbal teas? Mine are handmade one at a time so that exactly the right amount of each carefully chosen herb goes into each one. I have two brand new ones too! All teas are loose and can be made in a teapot, cafetiere, or using a tea strainer of some type (I also stock one-cup "tea ball" strainers for £3 each). Teas are not suitable during pregnancy or breastfeeding. 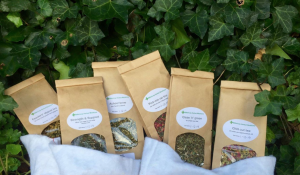 I'm not a "shop" as such so if you would like to buy you can Facebook message, email me at info@billericayherbal.com or just ask if you see me! I take Paypal or bank transfer or cash in person. Please note that my primary job is seeing patients so I may not get back to you immediately but will do so as soon as I can. P&P if required is £3 second class or £3.50 first class. How can herbal medicine help with stress?